There are only a couple of categories in the 000s that people even look at: the computers (at 004 and 005), encyclopedias (at 032), and journalism (at 070). Out of these, computer books are our most popular. I have really been poring over computer books recently. 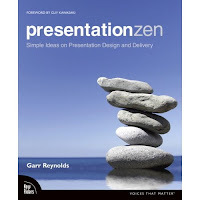 By far, the one that I am in love with is Presentation Zen: simple ideas on presentation design and delivery, written by Garr Reynolds. Basically, the central theme of the book is that slides should support the presenter, not replace the presenter. If you want to "check out" the book before you check it out at the library, take a look at Reynold's presentation tips on his website.